As many of you are doing, I too am reflecting back on 2017 and looking forward to what 2018 has in store. Asking myself, what did I learn about myself? What would I have changed? What did I enjoy the most? What am I looking forward to experiencing? If I had to pick one moment... There are so many experiences I had, new people I had the profound pleasure of meeting, places I got to explore, and so many things to be grateful for, that I could spend many blog posts on just those. BUT, this blog is for something different. Something new. Something I have never done before. Project 365 (which I would love to have another name for, so please leave some suggestions in the comments) is to challenge me in my photography journey. One new (or few) pictures everyday for the whole year. Pictures with stories, some connected to my business, but mostly just for fun! To force me to try new things, experience more places and meet new people. I want to push my limits and test boundaries. I want to meet people I probably wouldn't have taken the time to meet and go places I might not ever experience. I want to be challenged and I want to be motivated. Closing out 2017, I spent a lot of time focusing on gratefulness. Seeing and counting the blessings that God as blessed us with. I read a book, well to be honest I am still reading it, that really focuses on finding things in life to be grateful for. Even when things are hard or not going your way, there is something good to be found. The book challenges you to find and write down 1,000 gifts. Little things throughout your day that tugged at your heart strings. To slow down and be present enough to recognize these things when they happen. So while Project 365 is about challenging myself as a professional, it is also to challenge myself as a person. This is a new concept for me. Scary. Exciting. Challenging. I am nervous even as I type this. Getting outside my comfort zone and being present. Present in this life I have been blessed with. I won't blog everyday (I do not have the time for that), but I will make sure to recap those moments for you when they do happen. To tell short stories through my photographs. Some might be on a new hiking spot I found or a trendy restaurant I got to experience. Some might be about the people I meet or a new game I have played. Others might be about a new technique that I tried. There will be success and failures. Good and bad. Join me on this journey. A journey of exploring and learning. Today on my first day of Project 365, we decide to take the boys to Portland. We have been sick most of Christmas break and wanted to end it doing something fun. 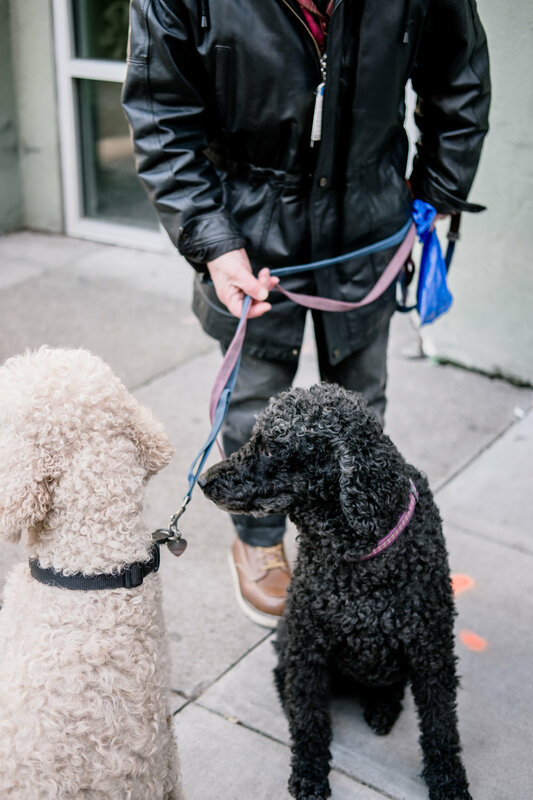 As soon as we parked, we came across a man walking his two poodles. Yup, poodles. His name was Ron. Ron isn't like me and you. You see, his poodles are his service dogs. And boy was he proud of them! We stood and chatted with him for about 5 minutes. He shared little stories with us about his doggies and I struggled with if it was appropriate to ask for a picture. In the end, my husband was the one who asked, but still feeling a bit self conscious, I decided to not take a full picture of Ron. This however is Ron and his two service dogs. An opportunity to meet someone that I never would have thought to talk to. We also took the boys to explore a record store for their first time. We choose Everyday Music in downtown Portland. A fun vinyl store with friendly staff and a huge variety of new and used records. A place I might never have visited. Enjoyed lunch at Whole Foods, where I still can't believe there is a whole grocery store right downtown. I mean yes, even city dwellers must eat, but it is fascinating to me none the less. And we ended the day at OMSI where the boys got to spend a couple hours playing games and building things! With day one drawing to a close, I do want to thank you all. For your support and love as I maneuver through this new adventure. Also, I am a HUGE fan of supporting local, so if you or someone you know own, or would recommend a place or service let me know in the comments bellow! !